for Soil Testing - The instrument consists of a needle attached to a spring loaded plunger, the stem of which is calibrated to read 0 to 40 kg division. Long stem is graduated at every 12.5mm to read depth of penetration and for use with needles of larger areas. The small penetration stem is also graduation in 12.5mm division and is used with needles of smaller areas. Needle points one each of 0.25, 0.5, 1.0, 1.5, 2.0, 3.5 and 6.0 sq Cm. And one tommy pin is supplied. 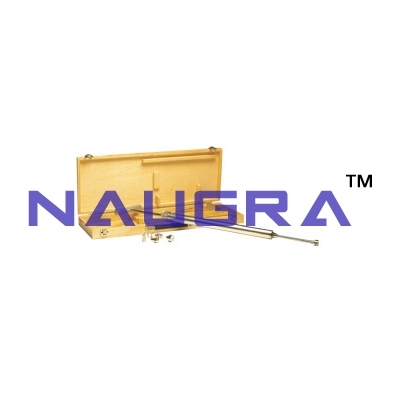 Complete as above in a wooden carrying case..
We are leading manufacturers, suppliers & exporters of Proctor Needles (Spring Type) For Testing Lab for Soil Testing Lab. Contact us to get high quality designed Proctor Needles (Spring Type) For Testing Lab for Soil Testing Lab for schools, colleges, universities, research labs, laboratories and various industries. We accept bulk orders for government tenders in all countries around the globe.